What is the TFCC? How do you Assess it? Working in an outpatient orthopedic therapy clinic exposes clinicians to a variety of unique and complex diagnoses and dysfunctions. For many clinicians, one of the draws to working in outpatient orthopedics is the challenge provided by treating all sorts of different conditions and diagnoses. 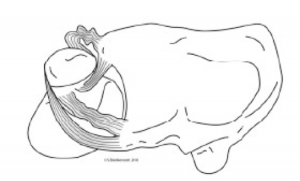 When it comes to the wrist, conditions involving the distal radioulnar joint (DRUJ) and the triangular fibrocartilage complex (TFCC) provide that challenge. If you are a new grad or a clinician that hasn’t spent much time treating or working in an orthopedic setting, acronyms like TFCC may appear intimidating or scary. My hope is that after reading this article, you will have a better understanding of the clinical anatomy of the DRUJ/TFCC and be able to apply some of this knowledge when treating clients or patients suffering from injuries to those structures. To understand the clinical anatomy of the TFCC, we must first review the structures of the distal radioulnar joint (DRUJ). 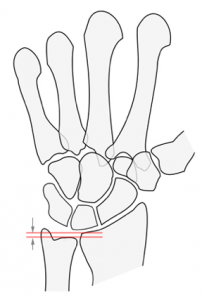 The distal radioulnar joint, or DRUJ, is comprised of two parts or components. The first component of the DRUJ is the articulation of the ulnar notch of the radius and the distal end of the ulna. This articulation plays an important role in normal functioning of the wrist. The ulna acts as an axis, around which the radius will rotate during supination and pronation (turning your palm up and down) . 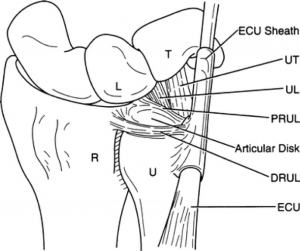 The second piece of the DRUJ is the articulation of the proximal carpal row distal end of the radius. This is where the scaphoid and the lunate bones in the wrist articulate with their respective fossa at the distal radius . Each of these structures provides important components of stabilization along the length of the radius and ulna, and ultimately at the DRUJ. The pronator quadratus muscle is a small, square-shaped muscle located at the distal radius and ulna. It plays a crucial role in providing anterior stability to the DRUJ. In fact, in cases of chronic DRUJ stability due to ligament dysfunction, the pronator quadratus muscle can be surgically advanced to provide additional anterior stability to the DRUJ . The interosseous ligament provides axial stability —or stability along the axis of the radius or ulna . With its thick fibers, it ensures that the radius and ulna remain in the proper position, avoiding both positive and ulnar variances from occurring (more on ulnar variance later on). 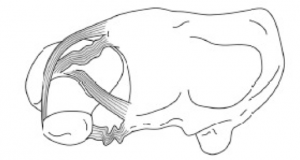 The final extrinsic stabilizer of the DRUJ is the tendon of the Extensor Carpi Ulnaris (ECU). It crosses from the lateral epicondyle of the humerus and inserts at the base of the 5th metacarpal. 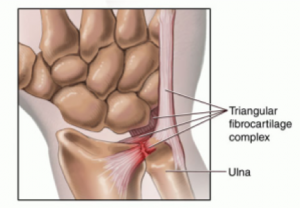 It plays a role in stabilizing the DRUJ it’s tendon sheath blends with the triangular fibrocartilage complex (TFCC) . Volar and Dorsal Radioulnar Ligaments (RUL). These are divided into superficial and deep components. All of these structures play an important role in the stability of the DRUJ during normal movements like supination and pronation (turning your palm up and down). 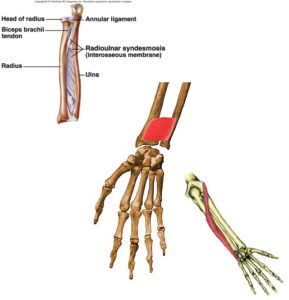 Especially during those movements, the ulna acts as an axis, around which the radius rotates. The TFCC also provides a gliding surface across the distal ends of the radius and ulna . It suspends the carpal bones on the ulnar side of the wrist (lunate and triquetrum) from contacting the distal ulna and radius. This is particularly useful during gripping movements, which tend to apply an axial force, bringing the ulna close towards the carpal bones . 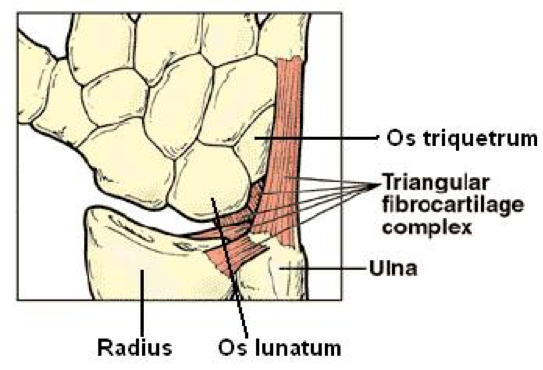 The TFCC also connects the ulna to the solar aspect of the carpus, which provides additional anterior stability. The main role of the TFCC is to provide stability to the DRUJ during rotational movements, such as pronation and supination . As I’m sure you are aware, the typical DRUJ possesses approximately 180 degrees of rotational movement: 90 degrees from neutral to full supination, and 90 degrees from neutral to full pronation. The TFCC provide stability throughout this motion. The TFCC also provides some translational movement of the ulna during pronation and supination . 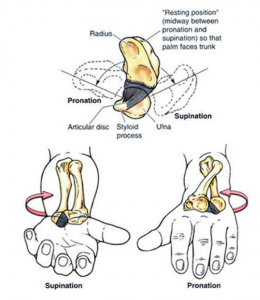 During pronation, the ulna moves dorsally (to the back of the wrist) to provide additional stability to the DRUJ. This can be clearly seen and palpated when the hand is fully pronated (palm down). At the ulnar side of the wrist, the ulna is easily seen and protrudes slightly on the dorsal aspect of the distal forearm. During supination, the ulna moves more to the palmar aspect of the forearm . During pronation and supination, two of these ligaments will tighten and two will loosen. This provides stability throughout the rotational movement and also contributes to the translation of the ulna . It may be difficult to tell from these illustrations, so let me explain what is happening with each ligament during supination and pronation. During pronation, the dorsal superficial and deep palmar ligaments tighten and the palmar superficial and deep dorsal ligaments loosen. The opposite occurs during supination: the palmar superficial and deep dorsal fibers tighten, and the dorsal superficial and deep palmar fibers loosen  . In this way, the RUL provide stability to the DRUJ during pronation and supination and prevents dislocation of the radius as it rotates around the ulna. Because the TFCC plays such a vital role in stability and motion of the distal radioulnar joint (DRUJ), any injury to the TFCC can cause pain, range of motion limitations, and instability. Ulnar impingement can also result from an injury to the TFCC. 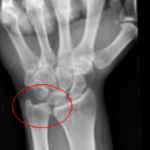 Ulnar impingement occurs when a positive ulnar variance is present, most often due to TFCC instability or dysfunction. Negative: The ulna projects more proximally (away from the carpal bones. Negative ulnar variance is associated with Kienbock Disease, however a positive ulnar variance is indicative of Ulnar Impaction Syndrome. 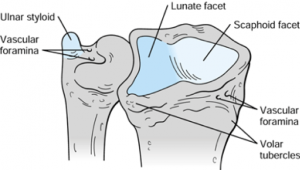 One of the major causes of ulnar impaction syndrome is dysfunction or pathology at the TFCC    . Class 2: Degenerative Injuries or Lesions. Class 1, or traumatic/acute, TFCC injuries can occur during a fall on an outstretched and pronated hand, during acute rotational injuries (think hammer drill), and/or as a result of some quick, forceful distraction force. Class 2 injuries on the other hand, usually result from repetitive strain injuries, hypovascularity or poor nutrition (most commonly at the central portion of the TFCC), or an anatomical variation. Some people simply have a natural positive ulnar variance. This, over time, can develop into a degenerative injury of the TFCC . As with any physical assessment, when assessing a wrist for a possible TFCC injury, we as clinicians should try to rule out alternative diagnoses or conditions before saying anything definitive. Instability at the DRUJ, while being indicative of a possible TFCC injury, does not automatically mean that someone has a TFCC lesion. As mentioned before, the TFCC is not the only structure that provides stability to the DRUJ. During assessment, the clinician should also assess the interosseous membrane and the extensor carpi ulnas tendon. These two tend to be the most common alternatives to a TFCC injury  . Given the size and strength of the pronator quadratus, it tends to not be the cause of DRUJ instability. To rule out alternative causes for DRUJ instability, the clinician can perform three separate provocative tests on the patient’s affected wrist. The Radius Pull Test can be used to assess the longitudinal forearm stability provided by the interosseous membrane. The Clunk Test for the forearm may indicate that the interosseous membrane is not providing support between the radius and the ulna. Finally the Extensor Carpi Ulnaris Test can be used to determine whether there is a dysfunction or injury at the ECU tendon. Since the ECU tendon blends with the TFCC, an injury to this tendon can present in the clinic looking like a TFCC injury  . After ruling out potential alternative causes for ulnar-sided wrist pain and/or instability at the DRUJ, physical assessment of the TFCC should become the focus. You can palpate the TFCC by placing a finger on the ulnar side of the wrist, on the solar surface, just distal to the ulna. Tenderness with palpation may indicate a TFCC injury. As far as provocative tests go, there are three tests that are the most common and accurate for assessing TFCC injuries or lesions . The clinician positions the patient with their elbow bent (flexed). The wrist is placed in ulnar deviation. The clinician positions the patient with the elbow flexed. The clinician stabilizes the distal radius/ulna with one hand and with the other hand, grabs the patients’s hand at the metacarpals (like a handshake). The wrist in placed in ulnar deviation and the clinician provides a “compression” or sheer force through the ulnar side of the wrist. Ulnar-sided wrist pain, clicking or popping indicate a positive test . The patient is asked to place his/her hands down on a chair while sitting. 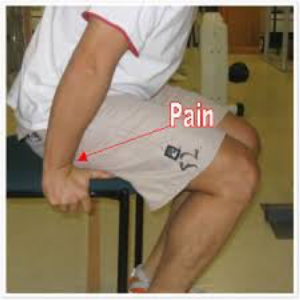 Instruct the patient to try and push himself/herself up off the chair, while weight bearing on extended wrists. Ulnar-sided wrist pain indicates a positive test. The two main radiological exams to assess the TFCC are X-rays and MRIs. Though x-rays do not show soft tissues, they provide insight into the position and alignment of bony structures within joints. This enables them to provide a lower cost way of assessing whether a TFCC dysfunction or tear may be present. When using X-rays to assess for potential TFCC pathology, ulnar variance is calculated. Positive ulnar variance correlates with TFCC tears, though you cannot be 100% certain with an X-ray alone, since you cannot visualize the soft tissues themselves . Unlike X-rays, an MRI shows soft tissue structures, allowing assessing physicians to visualize the structures of the TFCC to determine whether or not a tear or lesion is present. Studies show that MRIs can have an 86% sensitivity for detecting TFCC tears or lesions . Once it is determined that a TFCC lesion or tear is present, the surgeon will decide whether or not to pursue surgical repair or to try a conservative, non-operative, treatment plan. The treatment option that is selected impacts the rehabilitation clinician’s approach to treating patients with a TFCC injury or tear. In part 2, we’ll review treatment methods and protocols for both conservative and post-surgical rehabilitation of patients with TFCC injuries and lesions. Check out part 2 of this series, where we discuss treatment and rehab protocols. Read it here! Click here to head over to our resources section and check out our variety of clinical and professional resources aimed at increasing your knowledge and skills. We have many free and inexpensive resources, like our report on Total Shoulder Replacements or our Core-4 Shoulder Exercise Program.